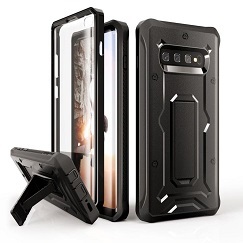 Armadillotek, a company that makes heavy-duty mobile device accessories, claims to have a Samsung Galaxy S10 unit in-house in order to make a case from its Vanguard series for the phone. It asserts that the screen protector that comes built into this model is incompatible with the fingerprint scanner found on the upcoming flagship. The Samsung Galaxy S10 series will be released in little over a month from now. According to what has been a busy pre-launch leaking season for the devices, they will come with a myriad of next-generation features and functions. They include an in-display fingerprint sensor, albeit one unlike pre-existing examples such as that found in the OnePlus 6T. Many rumors have indicated that Samsung will opt for one that depends on ultrasound, not optical, data to function. However, it now appears as if this tech will have drawbacks, particularly for those worried about protecting their new investments from scratches and other similar defects. The accessory-maker Armadillotek has posted a tweet on its official company account claiming that it had had live Samsung Galaxy S10 and S10 Plus units to work with while it crafts its range of cases for these SKUs. This tweet also states that the devices' fingerprint sensors did not work with their screen protector. This is an unfortunate piece of news for those who like to keep their phone looking new as long as possible. On the other hand, Armadillotek was referring to its Vanguard series of cases, which typically has an in-built screen protector made of thick plastic rather than glass. (Accordingly, the company now says it will not include this feature in this version of the case for the S10 line.) Therefore, there is still a possibility that the newer form of in-display fingerprint sensor may work with thinner tempered-glass protectors.